Ellen Allgaier Fountain is a signature member of the National Watercolor Society, Watercolor West, Western Federation of Watercolor Societies, the Arizona Watercolor Association, and the Southern Arizona Watercolor Guild (of which she is also a past president). She is a graduate of the University of Arizona in Tucson (BFA in studio art and MA in art education), and taught watercolor for several decades. 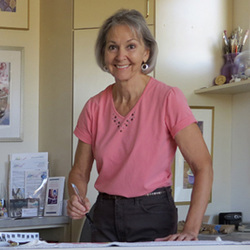 Recently retired from teaching watercolor classes at The Drawing Studio, she periodically conducts workshops for watercolor groups locally and throughout the country. If you'd like a studio visit, just contact Ellen to set up a time. Want to visit online? Need help taking photos of your art or want archival prints of your art?